DVT is a blood clot that forms in a vein that accompanies an artery, or a deep vein. While painful in itself, DVT is also life-threatening: should the clot dislodge and float through the bloodstream, it can block the flow of blood to an area of the body. 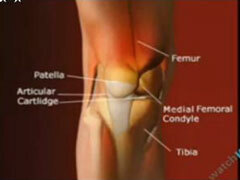 DVT is a rare—but significant—complication of total knee replacement. DVT usually affects veins in the lower leg and thigh. It occurs when a blood clot forms in the larger veins; this clot (or thrombus) may interfere with circulation or break off and embolize. The embolus moves though the blood stream and can lodge in any area, causing severe damage to the organ where it settles. The most common is a pulmonary embolism, when the embolus lodges itself in a patient's lung. DVT occurs in approximately 2 out of 1,000 people, most of who are over age 60.